The infamous gene editor CRISPR can now count SOD1 among its successes. Mutant forms of the gene cause amyotrophic lateral sclerosis (ALS), and transgenic animals harboring such variants also succumb to an ALS-like disease. Researchers led by David Schaffer at the University of California, Berkeley, infected these mice with a virus loaded with components CRISPR needs to target mutant SOD1. As described December 20 in Science Advances, it suppressed the gene in a hefty proportion of motor neurons in the spinal cord, and the mice developed disease a month later than expected (Gaj et al., 2017). However, the treatment was no magic bullet: It failed to target astrocytes, and did not slow progression of the disease once it started. Fashioned from an ancient bacterial defense system, CRISPR (clustered regularly interspaced short palindromic repeats) scuppers gene expression. 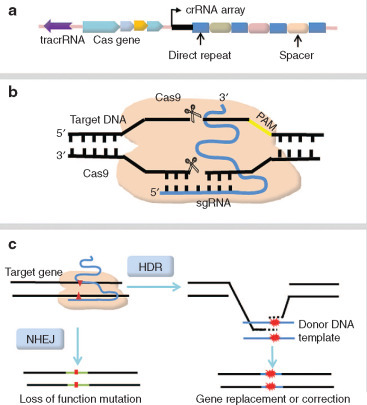 Complementary guide RNAs steer the Cas9 nuclease to the target DNA, whereupon it induces double-stranded breaks that lead to insertions or deletions (indels) that derail transcription of the gene (see October 2017 news). CRISPR can also be used to insert desired sequences and correct mutations, rather than simply halting transcription (see October 2017 news; Cox et al., 2017; Gaudelli et al., 2017). Researchers have rapidly optimized the tool, improving its specificity and slimming down the size of its components. The technology has potential to thwart expression of pathological variants, or even correct them, making it an attractive strategy for familial diseases caused by known mutations (see December 2017 news). SOD1 fits the bill. Antisense oligonucleotides have been used to dampen SOD1 expression in mouse models of ALS, but injecting them into the spinal cord has yet to trigger reductions in CSF SOD1 in ALS patients (see December 2015 news, May 2013 news; Miller et al., 2013). The researchers next injected this vector intravenously into newborn SOD1-G93A mice. They also used a guide RNA specific for the mouse Rosa26 locus as a control. An AAV9 strain that had been optimized to cross the blood-brain barrier delivered SaCas9 into 74 percent of choline acetyltransferase (ChAT)-positive neurons in the ventral horn, according to immunohistochemistry (see June 2017 news). However, astrocytes in the same region expressed little, if any, SaCas9. Astrocytes also make SOD1, and it contributes to neurodegeneration in mice (for review, see Taylor et al., 2016; Ilieva et al., 2009). Schaffer told Alzforum that the findings demonstrate CRISPR’s potential as a treatment for ALS, particularly in patients harboring an autosomal-dominant mutation in genes such as SOD1 or C9ORF72. However, he acknowledged room for optimization. Most importantly, researchers will need to design viral vectors that efficiently infect astrocytes. SOD1 expression in the glial cells reportedly exacerbates disease, and the lack of delivery to these cells likely explains why the treatment only delayed disease onset without slowing progression, Schaffer said (see October 2011 news). Schaffer told Alzforum that his lab is currently developing a library of millions of AAVs with an assortment of random mutations, in the hopes of finding one with a penchant for both neurons and glia (Ojala et al., 2017; see also July 2017 news). Robert Brown, University of Massachusetts Medical School, Worcester, pointed out that once a cell is infected with AAV, it will continue to express the transgenes for years. He thinks while this might be a desirable outcome in the case of RNA-based silencing strategies (see May 2017 news), which require indefinite silencing, it is both unnecessary and potentially hazardous in the case of CRISPR. Tweaking the virus to express CRISPR components transiently will be necessary, he said. Schaffer told Alzforum that his lab is working on generating such “short pulse” viruses. Gaj T, Ojala DS, Ekman FK, Byrne LC, Limsirichai P, Schaffer DV. In vivo genome editing improves motor function and extends survival in a mouse model of ALS. Gaj et al., Sci. Adv. 2017;3: eaar3952 20 December 2017. Ojala DS, Sun S, Santiago-Ortiz JL, Shapiro MG, Romero PA, Schaffer DV. In Vivo Selection of a Computationally Designed SCHEMA AAV Library Yields a Novel Variant for Infection of Adult Neural Stem Cells in the SVZ. Mol Ther. 2017 Sep 8. pii: S1525-0016(17)30418-5. PubMed. Cox DBT, Gootenberg JS, Abudayyeh OO, Franklin B, Kellner MJ, Joung J, Zhang F. RNA editing with CRISPR-Cas13. Science. 2017 Nov 24;358(6366):1019-1027. PubMed. Gaudelli NM, Komor AC, Rees HA, Packer MS, Badran AH, Bryson DI, Liu DR. Programmable base editing of A•T to G•C in genomic DNA without DNA cleavage. Nature. 2017 Nov 23;551(7681):464-471. PubMed. Miller TM, Pestronk A, David W, Rothstein J, Simpson E, Appel SH, Andres PL, Mahoney K, Allred P, Alexander K, Ostrow LW, Schoenfeld D, Macklin EA, Norris DA, Manousakis G, Crisp M, Smith R, Bennett CF, Bishop KM, Cudkowicz ME. An antisense oligonucleotide against SOD1 delivered intrathecally for patients with SOD1 familial amyotrophic lateral sclerosis: a phase 1, randomised, first-in-man study. Lancet Neurol. 2013 May;12(5):435-42. PubMed. Gaj T, Schaffer DV. Adeno-Associated Virus-Mediated Delivery of CRISPR-Cas Systems for Genome Engineering in Mammalian Cells. Cold Spring Harb Protoc. 2016 Nov 1;2016(11):pdb.prot086868. PubMed. Chan KY, Jang MJ, Yoo BB, Greenbaum A, Ravi N, Wu WL, Sánchez-Guardado L, Lois C, Mazmanian SK, Deverman BE, Gradinaru V. Engineered AAVs for efficient noninvasive gene delivery to the central and peripheral nervous systems. Nat Neurosci. 2017 Aug;20(8):1172-1179. PubMed.